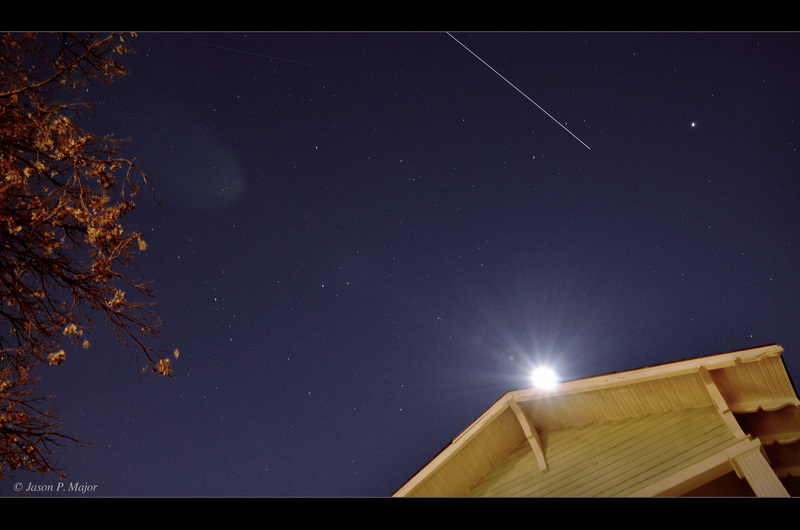 Brightest ISS Pass of 2012! Ok, I know it’s kind of a misleading title because it’s only 4 days into the new year but still, at magnitude -4.0 tonight’s flyover of the ISS was one of the brightest I’ve ever seen, this year or any other! At 6:28 p.m. CST, the ISS rose in the northeast and passed nearly exactly overhead, steadily moving southeast between the Moon and Jupiter in the evening sky. Even with a waxing gibbous Moon shining full blast it was still extremely bright, as my photo above shows. This was a 20 second exposure taken with a Nikon D7000, 18mm lens @ f/9, ISO640. Edited in Photoshop. Along the upper left another faint trail can be seen; this may have in fact been SkyMed-1, an observation satellite operated by the Italian Space Agency. The ISS is currently manned by 6 international astronauts. Traveling at 17,500 mph at an altitude of about 225 nautical miles, it orbits the Earth 16 times a day. Find out when it will pass by your location (and where to look for it) on Spaceweather.com here OR, if you use Twitter, be sure to follow @Twisst to get alerts whenever the ISS will be flying over your location! Image © Jason Major. All rights reserved. Previous Post No Doom in 2012: Stop the Insanity! Love this shot! It’s always a thrill to see the ISS. To catch it on camera…even better! Very cool shot! Thanks for sharing, Jason!